Plant tissues. Lacunar collenchyma. Atlas of plant and animal histology. Technique: paraffin embedding, section stained with Alcian blue. 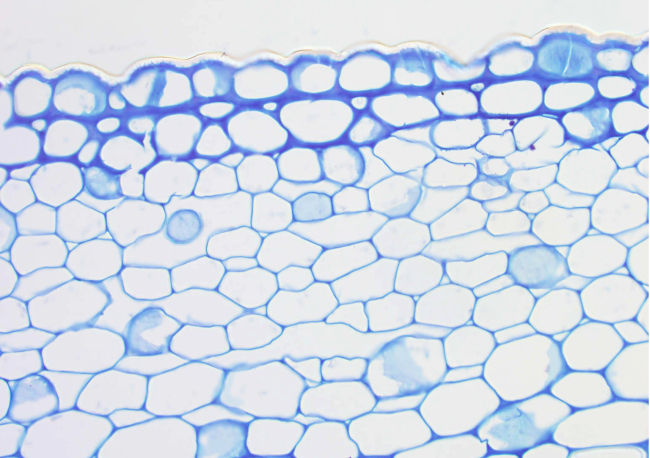 Lacunar collenchyma, like angular collenchyma, has primary cell wall thickenings located where adjoining cells are in contact. However, these thickenings do no fill completely the intercellular spaces and empty intercellular spaces can be observed.